My father, grandmother and I went for supper the weekend before the grand opening. It's a big menu. One of those menus you need to make a choice and close it so you don't change your mind. My Nan went with the Mushroom Chicken Penne, my Dad had the Bowl of Seafood and I had the Nacho Burger with fries. 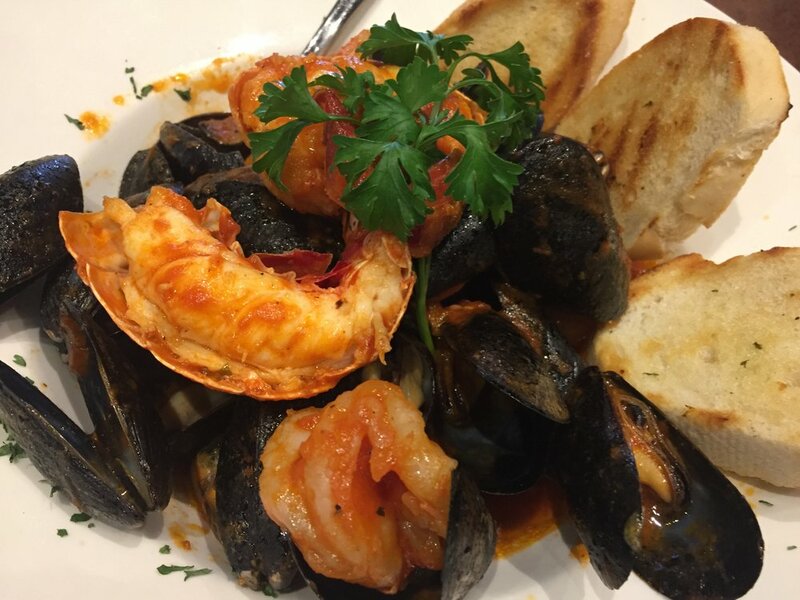 Tiger shrimp, lobster, PEI mussels and scallops served in a lightly spiced white wine tomato sauce. So savoury! My Nan was taking the bread from her pasta and dipping it in the tomato sauce! Pretty equal portions of each seafood stuffed in that bowl! The penne had lots of mushrooms, peppers and onions with a lot of chicken. There must've been a whole grilled chicken breast in there! The light cream sauce didn't weigh it down. My burger was gigantic and messy! The guac and salsa had no chance to stay on the burger. Guac was bland, but the salsa was sweet. Burger itself was juicy and the fries were awesome! My Nan and Dad stole many of my fries they were so good. 0 Response to "Portly Piper"